Swatch watches symbolized the switch from the 1970s to the 1980s for me. My 1970s watch was a clunky black digital, with a band that didn't bend and made you sweat and the same ugly digital face as any other digital watch. Swatches, with their bright colors and fun attitudes, were the 1980s on your wrist. It took me a long time to get into the Swatch world, but I think eventually I did get one. I don't think, however, that it was this awesome scented one, Granita di Frutta. But that smell will forever stay with me because I was a Seventeen magazine addict in the days before Sassy hit, and if I recall correctly, they had an ad for this particular Swatch, scented in the same smell. I loved it, and the smell didn't flee the magazine insert or whatever, it stuck around for months. In fact, looking at that link from Hillary Buckholtz's great "I'm Remembering," I think that's a picture of the magazine and the scented ad itself. Here's a closeup on Flickr. 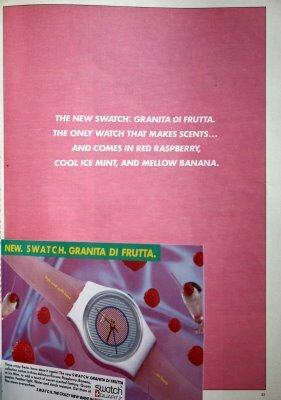 This 1985 Chicago Tribune article (bless you, Internet) says Granita di Frutta watches were the ones with "bands in Italian snow-cone flavors that are scented to match their colors: iced mint, sweet raspberry and mellow banana." Raspberry is the only one I ever heard of, then, but man, has its scent lingered in my brain, all these years. Here's another blogger who went through her issue of Seventeen and reports that the Swatch scent still lingers. Did you have a Swatch? A scented one? Did you know someone who did? My best friend had a few Swatches. I had a Timex my parents gave my fir jr. High graduation. I was in college in the mid-80s when Swatches became a craze for something like five minutes. I think you were supposed to get a bunch of them and wear them all along both arms, but I never saw that outside of a few music videos. As for me, I was too much of a nerd; I liked the Casio LCD watch I got for high school graduation, and that I wore for many years until the battery corroded... long after everyone forgot about Swatches. I remember the Seventeen ad. That is what drove me to NEED this watch. I had the pink one, with a matching pink Swatchguard. I kept it until about a year ago. By the time I sold it on Ebay, the pink bank was kind of dried-out feeling and had begun to turn a yellowish tint, but a faint bit of scent still clung! I wish I still had all my Swatches...they were way cool. I still have the pink one. It doesn't smell anymore though. I had three...a red and green plaid... a grey and black granite and a grey pop swatch. Loved them all and wore two at once. If I had been allowed more, I would have worn them all at the same time. The scented ones seemed to pop up here over the summer of 85 and quickly faded to the newer lines coming out with bolder colours. I still have all three. I will admit this on this blog.. I still buy and wear Swatch Watches! My children buy me the Mothers Day one every year...I even went to Switzerland in 1986 on holiday and bought 25 Swatches for my friends. I have all of the scented ones, still in their packages! As I am now a Pediatrician, I find that small children are fascinated by my crazy colorful watches and it makes visits easier. Back in the 80's, we would wear at least 2 or 3 at a time. I only wear one now! I had the iced mint one. I so wish I still had it!